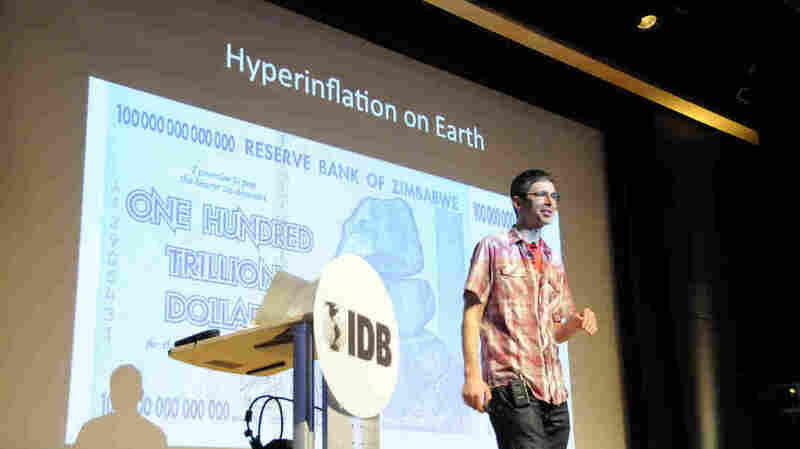 So A Global Economist Walks Into A Comedy Club ... : Goats and Soda Yoram Bauman is an economist. And a stand-up comic. Who makes jokes about climate change and global development, among other topics. At the Inter-American Development Bank this week, he killed! Yoram Bauman jokes about "hyperinflation in hell" and on earth. Case in point: the Zimbabwe hundred-trillion-dollar note. "There's a bit of a hold-up at the entrance. The line's out the door, so we're going to wait a few minutes to get started." By the time Bauman takes the stage, the packed house — looks like at least 200 people — are cheering and clapping for the world's first stand-up economist. He grabs the mic and starts his set by admitting just how strange his profession is. When he told his dad that he wanted to use his Ph.D. in economics as the basis for a comedy career, his dad was unsure. "He didn't think there would be enough demand." On a Monday night, in the basement auditorium of a development bank, this is the kind of joke that kills. Bauman tries another. "I told him not to worry. I'm a supply-side economist. I just stand up and let the jokes trickle down." I'm not so sure about these economics puns myself, but the crowd is eating it up. "I believe in the Laffer curve." Crickets. Bauman doesn't mind. He waves off the silence. "That's my test of how much economics you know. I give you guys a six." Since that's roughly the grade I got on my Economics 101 final exam, I am understandably wary about a stand-up economist. But Bauman has managed to make a career out of economics-based humor, presenting at colleges, professional conferences and comedy clubs. He's also the co-author of three cartoon textbooks: The Cartoon Introduction to Microeconomics, The Cartoon Introduction to Macroeconomics and, out this summer, The Cartoon Introduction to Climate Change. "I'm not going to say it's a semester's worth of economics, but it's not bad," says Bauman in an interview before the show. The books have been translated into a dozen languages. The latest is Mongolian. The comic has a serious side as well. One minute, he's making fun of Libertarians ("Left-wing Libertarians want the freedom to do drugs, right-wing Libertarians want the freedom to use guns, and neither of them believe in Social Security. Although with those interests, who is going to make it to 65?"). The next minute he's pitching you his idea about environmental tax reform. In addition to being a comedian and an economist, Bauman has committed his life to "using the tools of economics and the power of capitalism to protect the environment." In fact, Bauman works with a group, Carbon Washington, that has a measure on the ballot in 2016 to implement a carbon tax in Washington state. "If we had higher taxes on carbon and other types of pollution, we could afford to have lower taxes on things like income and investment," he says backstage. "Higher taxes on bads, lower taxes on goods. When I first saw that idea as an undergrad, I thought it was intellectually beautiful. Now, I'm spending my life working on it." Even if you don't quite understand environmental tax reform (shame on you! ), you find yourself nodding along and agreeing like it's a cheesy infomercial: I do want lower taxes on income! I don't want the Earth to burn! Bauman spent five months studying global warming in China, where he got the T-shirt he often wears onstage: the word "capitalism" written in the Coca-Cola brand font. "The tag says, 'Made in China,' " Bauman reads. "It's 80 percent cotton, 20 percent irony." Tall and gangly, Bauman doesn't do much to subvert the physical stereotype of an economist. He wears the same short-sleeve, checkered button-down shirt to most of his shows, which he can unsnap at a moment's notice to reveal his punch-line T-shirt. He may be funnier than most who study the "dismal science," but his fashion sense fits the bill, which he acknowledges. "You might be an economist if you're an expert on money but you dress like a flood victim." Delivered with his self-deprecating shrug, even knock-off Jeff Foxworthy jokes get a laugh from the crowd. A development bank is the perfect setting for Bauman, where he can make jokes like this one: When life gives you lemons, development economists take 50 Kenyan villages, split them into two random groups, see how one group responds to lemons, and then write an article for the Journal of Economic Development. The woman sitting behind me had to leave the room to compose herself, she was laughing so hard. But he doesn't always hit the mark. When he submitted an idea about hyperinflation in hell for the humor column he edits for the journal Economic Inquiry, his editor asked: "Are we to assume that the dead have lost their ability to innovate?"